MindView software is a comprehensive visual learning tool. Based on Mind Mapping, it presents concepts in 5 interchangeable views, including Mind Map, top down, left-right, outline and timeline. By presenting material graphically, it allows students to brainstorm and visualize their ideas, organize their information, and expand on individual topics by making notes and attaching additional information. MindView then instantly turns information into a PowerPoint presentation or an easy to follow linear outline in Word, making MindView an invaluable visual thinking skill tool for any student. Turn ideas into presentations (PowerPoint or HTML) instantly! An essential part of visual learning is displaying and organizing ideas graphically. 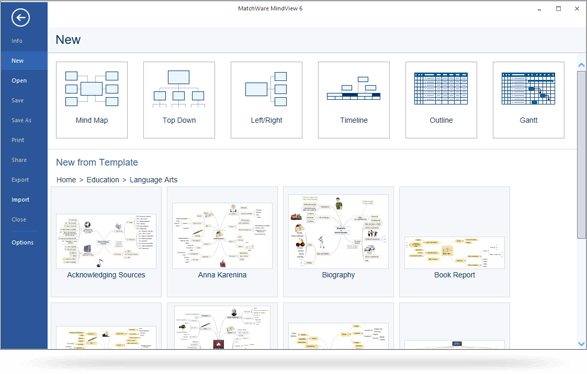 With MindView, students are able to present concepts and relationships and analyze, compare and evaluate information in 5 different views (Mind Map, top down, left-right, outline and timeline). Depending on individual preferences, students can work in a non-sequential view, such as the Mind Map, or in a linear fashion, using one of the other views. Ideas can easily be arranged and rearranged simply by dragging and dropping, allowing students to periodically brainstorm new ideas and reorganize them later. MindView provides over 80 cross-curricular templates in subjects such as language arts, science, social studies and history. All templates can be used as is, customized, or serve as inspiration for creating original layouts. By displaying information graphically, MindView enables users to quickly determine which ideas require illustration or elaboration. 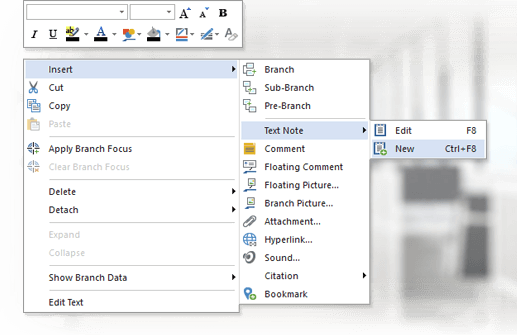 MindView makes it easy to attach relevant files, add notes using the built-in Note Card function, and insert hyperlinks to expand on topics and cite sources. 3 Turn Ideas Into Action! As a comprehensive visual thinking tool, MindView enables students to convert graphical layouts into impressive PowerPoint presentations or easy to follow linear outlines in Word with just a few clicks of a mouse. Linear outlines can then be used to quickly and easily create well organized and well written texts. MindView even lets users import and re-import Word files for continued brainstorming throughout their project and reorganize their information by simple drag and drop as they add new material.